Williams is widely regarded as one of the best locks in world rugby. Equally at home grafting away on the front line or with the ball in hand in the loose, Williams is a multi-skilled forward whose like is highly-valued in the modern game. The athletic second rower made his Super 12 debut for the Auckland-based Blues in 2002 and would go on to make his international debut for the All Blacks later the same year against England. He would court controversy a year later after being cited and later cleared of stamping on the head of England's Josh Lewsey. He retained his position in the All Blacks' line-up for their victorious 2003 Tri-Nations campaign. A stress fracture of the right foot almost prevented his 2003 Rugby World Cup participation but the insertion of a pin enabled him to feature strong in New Zealand's run to the semi-finals. He fell out of favour with new coach Graham Henry in 2004 but the unavailability of others saw him recalled for the 2004 tour of Europe where he started on Test. 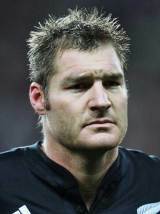 Williams served a six-week ban during the 2005 Super 12 season for trampling on New Zealand team-mate Richie McCaw but retained his place in the international ranks and would take a starring role in the series victory over the British & Irish Lions and feature strongly in the end of year grand slam tour. The following year brought more Tri-Nations success and another tour of Europe followed where Williams memorably demonstrated another aspect of his game against Wales. After fielding the ball in his own 22, he returned a superb kick that found touch on Wales' 10-metre line from where the All Blacks came away with the ball to score their third try of the game. Williams was one of the 22 players withdrawn from the first half of the 2007 Super 14 season in order to attend an All Blacks "conditioning camp" and on his return to domestic duties he fell out with the Blues, with whom he had won the 2003 Super 12 crown, in a row that eventually spawned a move to rivals the Crusaders. He suffered a fractured jaw against France in June 2007 but battled back to fitness in August to claim his place in the 2007 Rugby World Cup squad. But there was more disappointment on the sport's biggest stage as France accounted for New Zealand in a quarter-final upset. Williams, like many of that side beaten in Cardiff, bounced back in 2008 with yet more success. He was part of the Crusaders side that claimed the Super 14 crown and was also an ever-present as the All Blacks clinched another Tri-Nations title before completing another Grand Slam tour of the UK & Ireland. In the process he underlined his growing reputation and passed the 50-cap milestone. In 2009, Williams returned to Auckland and the Blues, but endured an injury-ravaged season due to problems with his shoulder and Achilles. He announced that he was to have surgery on the injuries in July that year with the operation subsequently ruling him out of action for six months. He suffered another Achilles injury in pre-season action ahead of the 2010 Super 14 season and his recovery once again sidelined him for the rest of the year. He launched his latest comeback with a short-term loan at English club Nottingham in early 2011 where he hoped to prove his fitness ahead of the new Super Rugby season. Williams turned in some fantastic performances in the latter stages of the 2011 Super Rugby season and played a key role in the Blues' passage to the Semi-Finals, scoring a try against the Waratahs in the qualifier. And Ali Williams forced his way into reckoning for a starting spot for the All Blacks come the World Cup after being named in their 30-man squad for the tournament. Williams appeared in all seven of New Zealand's games, including starts against Canada and Tonga, as they claimed the World Cup for the second time.